book blogger appreciation week – read this book! Book Blogger Appreciation Week is currently dominating my blog, and I am okay with that. I’ve had a lot of fun talking about blogs I appreciate, participating in the interview swap, and writing an ode to book blogging. Today’s topic is a little bit different – the idea is to talk up a book that needs more attention. 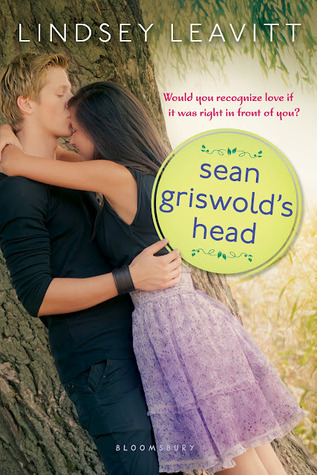 I can’t think of a more deserving title than Sean Griswold’s Head by Lindsey Leavitt – it is sweet, sincere, and has emotional depth that will surprise the reader (in a good way). I found it funny and adorable last summer, and then NO ONE commented on the review. I was shocked. What had I done/not done? And then it occurred to me...it was probably the cover art (or i'm not good at explaining why contemporary YA = fun.) (i'll take that, i guess.). Problem solved in paperback! According to her guidance counselor, fifteen-year-old Payton Gritas needs a focus object – an item to concentrate her emotions on. It's supposed to be something inanimate, but Payton decides to use the thing she stares at during class: Sean Griswold's head. They've been linked since third grade (Griswold-Gritas-it's an alphabetical order thing), but she's never really known him. The focus object is intended to help Payton deal with her father's newly diagnosed multiple sclerosis. And it's working. With the help of her boy-crazy best friend Jac, Payton starts stalking-er, focusing on-Sean Griswold…all of him! He's cute, he shares her Seinfeld obsession (nobody else gets it!) and he may have a secret or two of his own. In this sweet story of first love, Lindsey Leavitt seamlessly balances heartfelt family moments, spot-on sarcastic humor, and a budding young romance. Sounds like a very sweet story, and I can well relate to loving a book only to hear the deafening sounds of *crickets* on your review. You've gotten my attention on this one! I need more YA in my life. I've strayed too far down a dark, twisty lit-fic route lately . . . Thanks for the recommendation, I love a sweet story! This really sounds good! I will check it out. Thanks!! Ooh, this sounds perfect for me! I've added it to my list. Sounds like a good, sweet story! Thanks for sharing it! White contemp YS is not my favorite genre, this one looks really good! The paperback cover is quite delightful and this sounds like such a sweet and funny story.